Hanover, August 3, 2016. The international technology company Continental is raising its earnings forecast for the current fiscal year on the basis of good half-year figures. “We are aiming to achieve an adjusted EBIT margin of over 11 percent for the year as a whole and thus exceed the previously anticipated margin of around 11 percent,” said Dr. Elmar Degenhart, Continental’s chairman of the Executive Board, at the presentation of the business figures for the first six months of the year on Wednesday. The reason for the increase is the Rubber Group’s excellent operating performance: “The very positive unit sales development in our tire business in the first six months has given us an additional boost.” The company’s development is also being helped by the trend in the prices of key raw materials for the production of tires and other rubber products. Over the year as a whole, the price increases are currently expected to be lower overall than forecasted at the end of the first quarter of 2016. Click here for key figures for the Continental Corporation. The Continental Corporation’s net indebtedness amounted to €3.4 billion at the end of the first half of the year. The main reason for the increase compared to the first quarter of 2016 was the distribution of the dividend for fiscal 2015 in the amount of €750 million in May 2016. Compared to the end of 2015, net indebtedness decreased slightly by €96 million. The gearing ratio amounted to 25.8 percent at the end of June 2016 (previous year: 34.1 percent). The equity ratio was around 39 percent. As at June 30, 2016, Continental had a liquidity buffer of more than €5.2 billion, comprising €1.7 billion in cash and cash equivalents and €3.5 billion in committed, unutilized credit lines. Compared to the previous year, interest expense decreased by €50 million to €98 million. The negative net interest result also fell by €50 million year-on-year to €49 million in the first half of 2016. In particular, valuation effects from changes in the fair value of derivative instruments and from the development of exchange rates had a positive effect here overall. The positive contribution to earnings in the first half of the year amounted to more than €54 million. “For the year as a whole, we still anticipate net interest expense of less than €250 million, since there may be a reversal in the positive valuation effect in the second half of the year,” explained Schäfer. 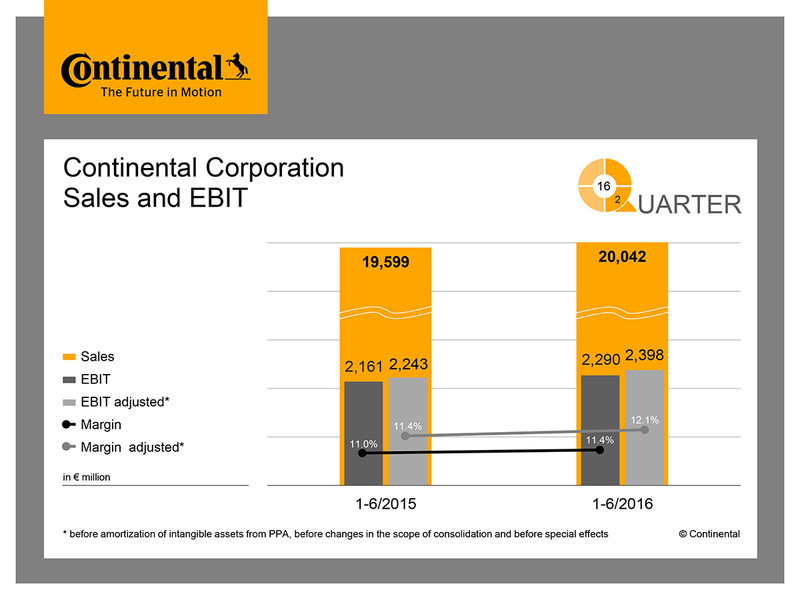 In the first six months of 2016, Continental invested €920 million in property, plant and equipment, and software. As a result, the capital expenditure ratio amounted to 4.6 percent after 4.2 percent in the comparative period of the previous year. In the first half of 2016, research and development expenses increased by 13.2 percent year-on-year to €1.4 billion. This corresponds to a ratio of 7.2 percent of sales after 6.5 percent in the same period of the previous year. “Our growing financial strength enables us to increase investment in research and development. In doing so, we intend to set the course for pioneering technologies at an early stage and continue our rapid, profitable growth on a long-term basis. Zero road-traffic accidents, clean air, and intelligent mobility are the relevant goals in this context,” said Degenhart. As at the end of the second quarter of 2016, the corporation had approximately 215,000 employees, around 7,000 more than at the end of 2015. The number of employees in the Automotive Group rose by more than 5,000 as a result of increased production volumes and expansion of research and development. In the Rubber Group, further expansion of production capacity and sales channels led to an increase of almost 1,900 employees. Compared with the reporting date for the previous year, the total number of employees in the corporation was up by around 9,600. In the first six months of this year, the Automotive Group achieved sales of €12.2 billion. The adjusted EBIT margin was 8.1 percent. 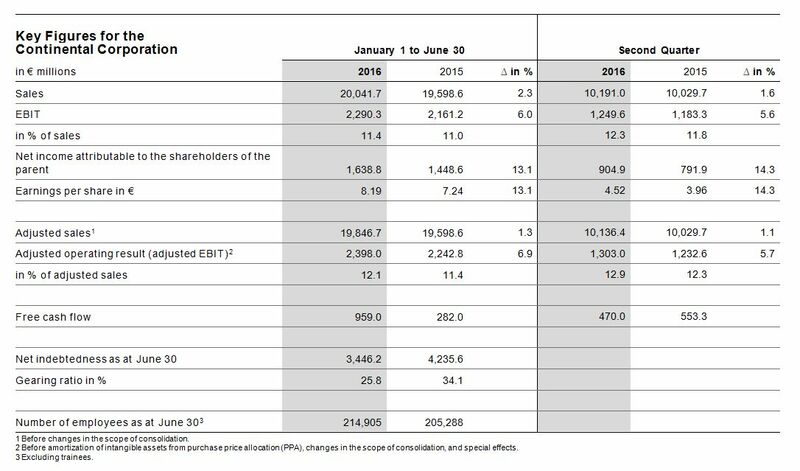 In the first half of 2016, the Rubber Group generated sales of €7.9 billion and improved the adjusted EBIT margin by 2.3 percentage points year-on-year to 18.8 percent. Here you can download the "Financial Report as of June 30, 2016" as a pdf file.